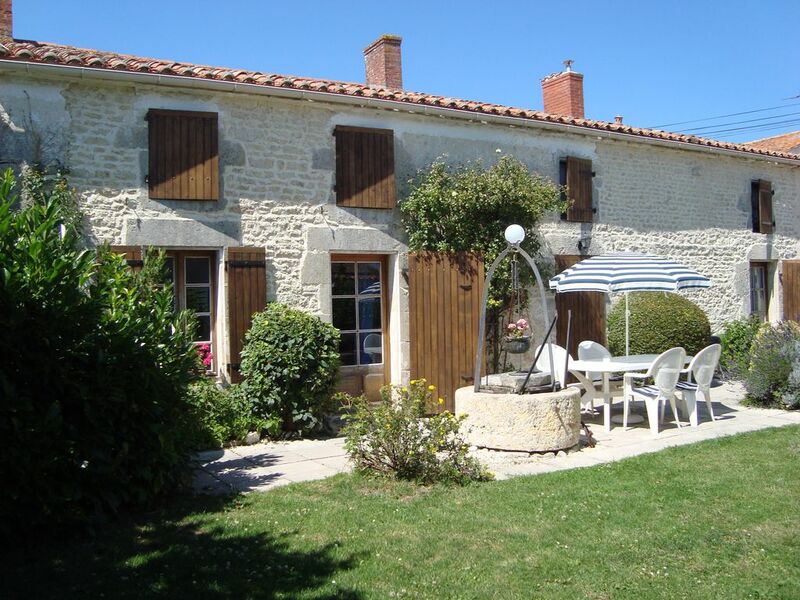 A beautifully restored farmhouse, set in the Charente Maritime region (renowned for being the second most sunny part of France). The house can be found in Chambon, a typical French hamlet with beautiful areas for birdwatching, cycling and walking. The bakery delivers bread daily (not Wednesday) and the town of Surgeres, 5 miles to the east, has supermarkets, bars and restaurants, an indoor swimming pool and pretty river walks. Aigrefeuille d'Aunis, 5 miles to the west, has an outdoor market twice a week selling fresh fruit, vegetables and fish. It also has an outdoor swimming pool and a landscaped lake. Historic La Rochelle is only 25 mins drive away. Here you can sunbathe on the beach at Les Minimes, visit the aquarium or take the bus boat from Les Minimes to the beautiful harbour and enjoy the excellent sea food offered in the restaurants on the harbour front. La Rochelle airport has direct flights from the UK and Ireland with low budget airlines such as Ryan Air, Fiybe, Easyjet and Jet2. Les Trois Puits was derelict when purchased - it was last used by the French Resistance Fighters in World War Two - but it was immediately obvious it had wonderful potential. It took nine years to restore it to its original, rustic charm. In 2001 it was advertised with owners direct as their 4th French property-FR4! The reasons why we bought Les Trois Puits: my family fell in love with La Rochelle, only a 30 minutes' drive away. Les Trois Puits is in the second sunniest part of France - only the Riviera has more hours of sunshine per year. It is easily accessible, with La Rochelle airport only a 35 minute drive, the ferry port of St Malo a manageable four-hour drive, and the Eurostar now running from St Pancras to La Rochelle/Surgeres with only one change in Paris. Les Trois Puits is close to the beautiful beaches of La Rochelle and Chatelaillon but also situated in the heart of the French countryside. In May the fields are full of pale lilac poppies and in June/July, the most amazing sunflowers. The surrounding countryside is perfect for walking, bird watching and cycling. Outdoor swimming pools are located within ten minutes drive in Surgeres and Aigrefeuille. The local boulangerie will deliver what ever you request - fresh bread, croissants, pains au chocolat-to the kitchen window! The walled garden provides a sun trap and many visitors to Les Trois Puits have commented that the stars are spectacular! Large shower room with wc. Separate wc on the ground floor. Can be used for a nominal fee in the owner's barn. Cooker, microwave, fridge freezer, dishwasher, washing machine. Notes on accommodation: Sorry, no pets. The farmhouse has heating. The three bedrooms and lounge have radiators with programmed timers. The lounge and kitchen also have very efficient wood burning stoves. Outside: It is a mature, walled garden. The grassed area in front of the house is a suntrap and perfect for sunbathing.There is a terrace with barbecue and garden furniture. Towels / Linen Bed linen and white towels can be hired from the owner if required for a nominal fee per person . This property can be rented with Fr16838 and /or a self contained studio for 2 people. Please ask the owner. Other: Entrance room with writing bureau and delightful fireplace. Conveniently situated near to La Rochelle and the airport and all the surrounding attractions and islands. Les Trios Puits is a fantastic converted barn with loads of space and everything needed to make a very comfortable stay. Hazel is a great, welcoming host with lots of local knowledge and keeps the gardens and properties in great shape. The garden was a real sun trap. Thoroughly enjoyed our stay and hope to return again soon. We stayed here August 8th - 22nd 2017. The house is fab and fully equipped with all you need. The garden too is a sun trap - lovely to sit in to chill and relax, but has some shady areas too. We enjoyed sitting out for meals and using the BBQ in the evening. It is in a rural, quiet location but has easy access to many attractions. La Rochelle is just 30 mins away and a fantastic place to explore or to sit and watch the boats. Lovely restaurants line the harbour and the town has a vibrant atmosphere. There are also great walks to be had walking out to the marinas. We visited Saintes and Il d'Oleron which was beautiful and the beach at Chatallailon (again only 30 mins away) was superb! A lovely town, huge sandy beach with cafes and restaurants alongsIde. So many other places still to visit and explore! Hazel was a great host - she has loads of knowledge about the area, places to visit and was always on hand for any questions. We enjoyed chatting with her over a glass or two one evening! Whilst the weather wasn't always the best, there was plenty to see and do and we hope to return to explore the area more! Thank you Hazel for all your help and for sharing your house with us. We had a fab holiday, loved the area and look forward to visiting again! Our second stay at Les Trois Puits was as good as the first, super location and a very well furnished property, excellent linen, very comfortable and relaxing. Hazel Feeney looked after us well providing information regarding all the interesting places to visit and supermarkets about 10 minutes away with only light traffic on the roads. Fresh bread delivered daily and only half an hour from the airport what more could one ask. Many thanks for your lovely review. It was brilliant to welcome you back to Les Trois Puits. You had a great week of weather and enjoyed staying in the cool house, and shaded areas of the garden when it got a little too hot! La Rochelle and Fouras are great places to visit in September and enjoy the local restaurants, drink coffee and watch the people go by. I have booked you in for next year. Maybe you will make it to Royan and enjoy the long sandy coastline. See you in 2017! Another wonderful holiday in beautiful Chambon. The weather was excellent which meant day trips out to Ile de Re (a lot!!) and Rochefort. Having stayed in Les Trois Puits for the last five years, we just love this area and the house is stunning. Hazel, the owner cannot do enough for her guests and she always on hand if anything is needed. The picture says it all - relaxing, spacious, beautifully maintained and a 'must' for anyone looking for all of the above. Thank you Hazel. See you next year! There are very reasonably priced direct flights to La Rochelle from London, Stansted and Dublin with Ryan Air; Southampton, Birmingham, Glasgow and Manchester with Flybe; Edinburgh and Leeds with Jet2; London, Gatwick and Bristol with Easyjet and Cork with AerArann. The gite is 1.5 hours motorway drive from Bordeaux airport. Europcar, Hertz or Budget can arrange hire cars from either airport. The village of Chambon Bourg has an historic church and cemetery in which a number of French Resistance workers are buried. Les Trois Puits was used by the French Resistance during the war. The separate village of Chambon-Gare, 2 miles to the south has a post office. Flat country lanes fan out from Chambon, providing quiet and safe walking and cycling routes. The tall hedgerows lining the lanes harbour many species of songbirds. Buzzards, harriers, kites and owls are frequent visitors. Deer and hares are also to be seen. One walk that we enjoy will take you through the avenue of trees in the grounds of the Maison de Repos (a convalescent home) at nearby Marlonges, then through the village of Marlonges and back home. During June and July many of the fields surrounding Chambon are full of sunflowers. A 25 minute drive west will take you to La Rochelle with its historic medieval towers guarding the entrance to the beautiful Old Port. The choice of excellent places to eat and drink is endless. Street entertainments around the harbour every night during the summer make for a pleasant after dinner stroll. At the nearby modern marina complex of Les Minimes can be found many museums and a small beach. The famous Aquarium is now located near the old port. Other beaches can be found to the south of La Rochelle at Chatelaillon Plage and Fouras, both of which are a similar journey time from the farmhouse. Booking Notes: 25% deposit at time of booking. Full amount payable 3 months before the holiday. Changeover Day: Saturday is the change over date for the month of July. . Departure time is 10am and arrival after 4pm. The changeover date is flexible during off peak periods. Linen and towels are available free of charge for the months of July and August. Linen and white towels can be hired from the owner for a nominal fee per person from January- June and September to December. Notes on prices: Prices are for the property per week in UK Pounds.